What Are the "Ships of Tarshish"? Today the world's biggest ship-building nation — and the nation that builds the world's biggest ships — is Japan. A generation ago Britain had that distinction. Great Britain became the world's dominant power when she took command of the seas away from the Spanish fleets in the sixteenth century. These three primary races in the pre-Flood world passed through the Flood as a result of Japheth's and Ham's intermarriages. Japheth and Ham were white, but their wives were not. Japheth was the patriarchal ancestor of all Orientals and of many East and South European Whites. The children of Tarshish — like other sons and grandsons of Japheth — divided. That branch of the family inheriting Oriental traits migrated into East Asia. The other branch of his family, intermarrying with some of the children of Shem, settled first in Asia Minor near the city of Tarsus (where, centuries later, Paul was born). From Tarsus this branch of the family migrated through the Mediterranean into Spain and founded the great Spanish emporium of Tartessus. When Jonah fled from the Lord, he left for Tarshish on a ship out of Joppa, Israel's port on the Mediterranean (Jonah 1:3). 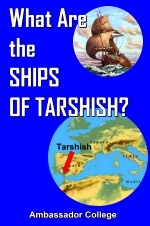 Ships making the distant runs to the lands of Tarshish came to be known in history as the "ships of Tarshish." The vessels that king Jehoshaphat built were called "ships of Tharshish" (I Kings 22 :48). Solomon's navy was known as the "navy of Tharshish" (I Kings 10:22). Israel's naval power in Solomon's day was one of the prime reasons for her national greatness. Centuries later the English-speaking nations — the modern-day descendants of the ancient so-called Lost Ten Tribes of the House of Israel — re-acquired national greatness through sea power. Though the United States is still a great military sea power — Britain has already lost her sea power and national greatness — a new nation in the Orient is rising to greatness through commercial sea power. That nation is Japan. Now look at Bible history once again. Israel anciently had another seaport. Ezion-gaber, on the Red Sea. This port served shipping headed for the eastern or Oriental branch of the family of Tarshish, not the Western or Spanish branch of the family. Solomon's eastern fleet "went to Tarshish" (II Chronicles 9:21) " every three years" to bring back "gold and silver" and other commodities. Jehoshaphat's fleet at Ezion-gaber was built "to go to Tarshish" (II Chronicles 20:36). Where is this gold- and silver-producing Eastern Tarshish? When the Spaniards — the western or white branch of the family of Tarshish — first encountered the Japanese, they referred to them as "the Spaniards of Asia" — by which they meant the Tarshish of Asia! (San Agustin's Letter on the Filipinos, § 5, quoted in The Philippine Islands 1493-1898, vol. XL, p. 192.) The Spanish writer Colin, in his Native Races and their Customs, lists Tarshish among the ancestors of the South and East Asians: "...the principal settler of these archipelagoes was Tharsis, son of Javan, together with his brothers, as were Ophir and Hevilath of India" (The Philippine Islands, vol. XL, p. 38). The name Javan is still preserved by the Javanese of Indonesia. Today Japan is again one of the great world powers. More goods in world trade are carried today in Japanese-built ships than in any other. The largest commercial ships afloat are Japanese-built. Is it any wonder that Bible prophecy takes note of the leading position of Japanese traders today? In speaking of trade with modern twentieth-century Europe, of which the ancient city of Tyre was a prophetic type, Ezekiel wrote: "Tarshish was thy merchant by reason of the multitude of all kind of riches; with silver, iron, tin, and lead, they traded in thy fairs" (Ezek. 27:12). The merchants of Tarshish are also mentioned in Ezekiel 38:13 in connection with a final alliance of Asian nations that will come against Palestine shortly after the return of Jesus Christ. God knew long ago the part which the children of Tarshish would play in world affairs. That is why He will have to break the "ships of Tarshish with an east wind" (Psalm 48:7) in order to bring the Japanese to their knees and to repentance.